Iran’s Supreme Leader Ayatullah Ali Khamenei in a message on the first day of the Islamic month of fasting, Ramadan said that actions of Saudi ‘royals’ are against the teachings of Holy Qur’an. They oppress and kill fellow Muslims while showering billions of dollars on the known enemies of Islam and Muslims. Such people are cursed by Allah and are doomed to perish. “The Saudi rulers are too harsh on Muslims, yet kind to the disbelievers. They are giving special handouts to the US. To whom does all this wealth belong? This is the nation’s (Saudi people’s) wealth, which they give away to disbelievers and their people’s enemies. The fools actually think they can gain the friendship of Islam’s enemies by providing them with money and assistance. There is no friendship there; as they say themselves, they are “milking them” like cattle. They oppress their own people in this manner, and oppress the people of Yemen and Bahrain in other ways. 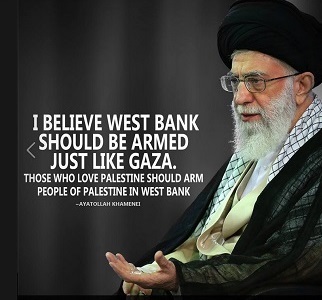 But they are going to perish,” said Khamenei. Iranian president Dr. Hassan Rouhani mocked Donald Trump’s anti-Iran rants in Riyadh and Tel Aviv as theatrical. Many American analyst have claimed that Saudi ‘royals’ recent US310 billion largesse to Donald Trump was in fact royal bribe for the US to attack Iran. “The United States have managed to solve the question of the succession of King Abdallah, but today, they are attempting to lead Saudi Arabia into error. Their objective is now to divide the country into five states. Wahhabism is the state religion, but the power of the Saud family, both interior and exterior, depends exclusively on Sunni tribes, while it subjects all other populations to apartheid. King Salman (80 years old) leaves the exercise of power to one of his children, Prince Mohammed (30 years old.) The Prince has seized control of his country’s major companies, has declared war on Yemen,” says French philosopher Thierry Meyssan (here). Sharmine Normani, a veteran British commentator and analyst wrote on May 23, 2017 that if Saudi Arabia dared to attack the Islamic Republic, it would be Saudi Arabia’s last war. “For years the Saudis have waged proxy battles against Iran, with little success. Now, despite this history of losses, Riyadh appears to be mobilizing for an ill-conceived confrontation with the Islamic Republic. If the Saudis launch direct aggression against Iran, this will be Riyadh’s last war anywhere, ever,” she wrote. Former US defense secretary Robert M. Gates had admitted that both Israel and Saudi Arabia want United States to fight their proxy wars in the region, but US had failed to win a single conventional war since WWII.